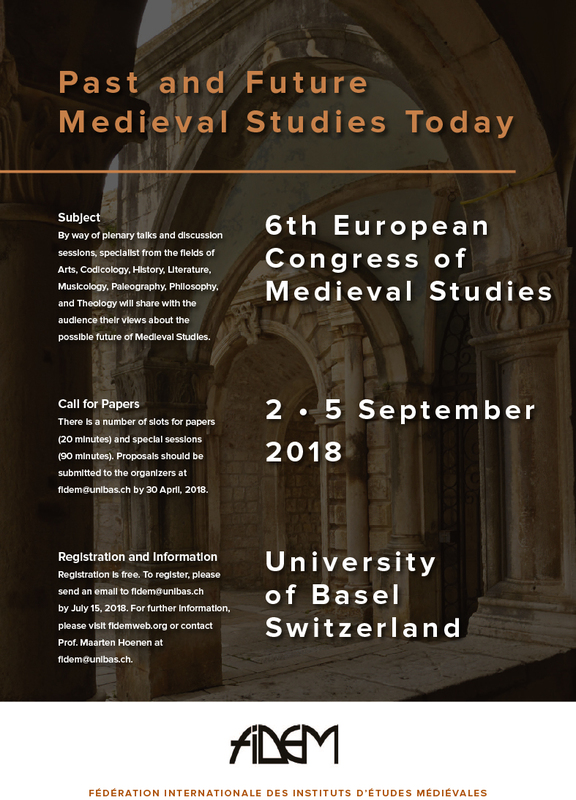 Il 2 – 5 Settembre 2018 si terrà a Basilea il 6th European Congress of Medieval Studies della FIDEM. La scadenza per la presentazione degli abstract è il 30 Aprile 2018. 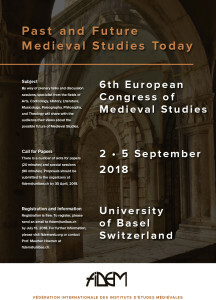 The 6th European Congress of Medieval Studies of the Fédération Internationale des Instituts d’Études Médiévales (FIDEM) will be organized by the Department of Arts, Media, and Philosophy of the University of Basel, Switzerland. Medieval Studies have always excelled by their vigorous scholarly methods and their inventiveness: it is within this realm that new methods of critical text editing were developed and became the standard across all the humanities; medievalists were among the first to seize the opportunities and chances offered by the digitization of texts; interdisciplinary research is the rule rather than the exception. With these features, Medieval Studies are well equipped to develop convincing answers to the challenges of the future in front of them. Distinguished by a vast regional diversity as well as global interaction and exchange, the Middle Ages both question and inspire our contemporary understanding as citizens of a globalizing world, a promising challenge calling for new ideas and powerful institutions suited to put the ‘European’ Middle Ages into relation with human achievements elsewhere on the globe. By way of plenary talks and discussion sessions, specialist from the fields of Arts, Codicology, History, Literature, Musicology, Paleography, Philosophy, and Theology will share with the audience their views about the possible future of Medieval Studies. There is a number of slots for papers (20 minutes) and special sessions (90 minutes). Proposals should be submitted to Prof. Maarten J.F.M. Hoenen at <FIDEM@unibas.ch> by 30 April, 2018. To facilitate attendance at the Congress, FIDEM stipends (500 €) are available for researchers under the age of 35, who will present a paper. Applications (including a letter of application, a CV and a letter of recommendation) should be submitted to Marta Pavón Ramírez, FIDEM Secretary General, at <secretary.general@fidemweb.org> by 30 April, 2018. On Tuesday, 4 September, the General Assembly of the FIDEM will take place in the Kollegienhaus of the University of Basel. At the General Assembly, the new board of the FIDEM will be elected. Further items of the agenda will be announced in advance. Registration is free. To register, please send an email to <FIDEM@unibas.ch> by July 15, 2018. In the next circular details on stipends, hotel accommodation and travel information will be provided. For further information, please visit <fidemweb.org> or contact Prof. Maarten J.F.M. Hoenen at <FIDEM@unibas.ch>.